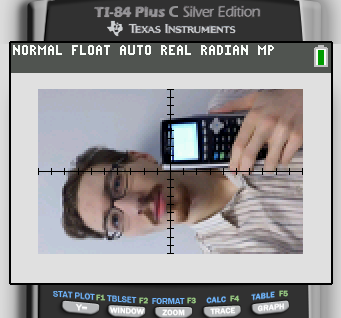 After a bit of pondering about an efficient way to palettize 265x165-pixel images, I got SourceCoder 2.5 to generate TI-84+CSE-compatible Picture files. As a refresher, Picture files can contain up to 15 different color (plus transparent pixels). 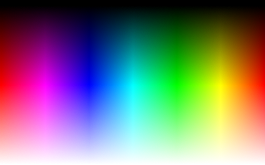 Currently, SourceCoder can generate all fifteen of those colors in images, but not transparent pixels. It does not do dithering, but does do nearest-neighbor matching for indexed color values. Check out two examples below, each with the original on the left and the Picture viewed on a TI-84+CSE at right. Wow, good job! That top right looks pretty butchered; I can see how this will be a great tool for artists & programmers to test whether or not their background images will display correctly! Is there any control over which colors? For instance, could there be a green, dark green and light green? Or are we limited to those 15 colors? You're limited to exactly those 15 colors, sadly. 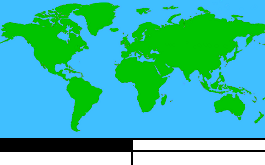 I wish there was a light green too; I'm not entirely clear why there is no such thing. Oh, bummer. I was hoping it could be 15 different colors at a time from the whole color spectrum. But, it'll be rather easy - despite the poor color selection - for artists to create background images that will not be butchered by the calculator. Hopefully sometime after the calculator goes on sale there will be ASM routines and libraries that are able to create whole pallets of colors and free up some creativity. Agreed. 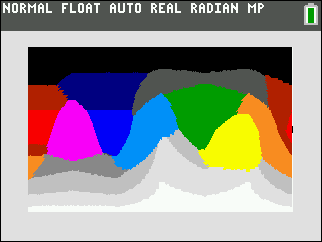 And remember that there's a separate 16-bit color datatype called the Image, each of which is 133x83 pixels. I haven't looked into the format for those yet, but I'm sure I'll add support to SourceCoder as soon as I figure it out. I guess they thought you'd rather have orange and those two extra grays. 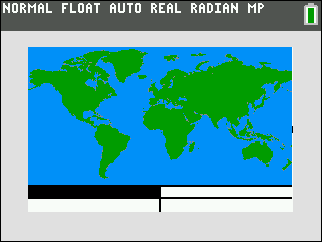 (I've always been pretty tired of the boring old 16-color CGA palette myself.) A palette-based system certainly would have been nice. That'd only require a little extra space in already-huge PICs. Or just not save palette info and leave it up to the program to set up the palette. I'd be willing to give up one of the three blues in exchange for another green, especially on a 5-6-5 display. A palette-based system certainly would have been nice. That'd only require a little extra space in already-huge PICs. Or just not save palette info and leave it up to the program to set up the palette. Hmm, interesting. Maybe you could have Doors CS functions for redefining the on-screen color codes for special palette effects. Does the display have any built-in palette-replace functions, or would the whole display have to be manually redrawn? The former would allow some nice color-cycling animations; otherwise you'd probably just be better off with drawing primitives that can draw directly in arbitrary colors. 2) Pics are saved as 8xi files instead of 8ci, so you have to rename the extension manually. By the way would it be possible to add the ability to create PRIZM BASIC pics in the future (the 8 color ones that can be created on-calc, not the 16 bit ones)? Would it be possible for SC to dither images using the calc's color palette? The gradient would look a lot better with dithering. © Copyright 2000-2019 Cemetech & Christopher Mitchell :: Page Execution Time: 0.178398 seconds.